These Andorra Thinsulate Gloves are one of the top selling pairs of winter gloves on Amazon and for good reason. They have pretty much every quality you could ever want in a pair of winter gloves and for a very reasonable price. These things are flying off the shelves and they have an extremely low return rate because people are getting exactly what they want. 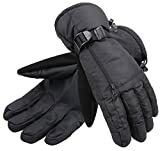 The title Amazon uses for these gloves is “ANDORRA Men Waterproof Thinsulate Touchscreen Winter Ski Gloves w/Zipper Pocket”. I have to say that it’s a brutal mouthful but those are all qualities that these gloves possess and I can understand why they would want all of them in the title. If you’re looking for a really good, comfortable pair of winter gloves for a reasonable price then this certainly will be a good option. These gloves fit pretty much true to size but if you’re between sizes and you’re not sure whether to go with a size up or a size down you should probably go with the size up. I found that they were true to size but there were some online complaints saying that the fingers were a little bit short. They’re made to fit pretty close to the skin so don’t be afraid if they feel tight at first. You just need to wear them for an hour or so and they’ll feel great because that’s the way they’re designed. If you’re still not sure what size to get you should check out our sizing guide. Since they fit close to the hand you’ll find that you have really good dexterity with them which is great for working zippers, getting into pockets or using your touchscreen device which they are compatible with. It’s awesome because you rarely need to take them off. They’re also really comfortable because of the fact that they fit close to the skin. They aren’t too bulky which almost makes you forget you’re wearing gloves at all. The interior of them is made from a fleece which feels awesome on the skin and wicks away moisture too. The exterior is a nylon with a rubber like palm which is very comfortable and good for gripping things. I’ve mentioned a few of the features already but I want to cover them in a little bit more detail just to be thorough. There’s a zipper pocket on the back of the hand which I absolutely love because it’s just so handy for things like keys or cards. Super easy to access at any moment. I already mentioned that these gloves are equipped with touchscreen compatible fingertips which is great for obvious reasons but one thing you’ll notice is that they didn’t just make the index finger compatible, they made all of them compatible. That’s a step up from most touchscreen gloves. You might think that you don’t need more than one finger to work with your phone but until you’ve used gloves with just that one finger compatible you don’t realize how much you use the other fingers. They also have the easy buckle wrist strap which allows you to tighten the cuff to your desired tightness. This gives you the option of tightening them around the outside of your jacket sleeve or tucking them underneath. In addition to the wrist buckle they also have the clip so that you can clip them together when you’re not wearing them. I always use this clip otherwise I find that I’m constantly digging around my bag looking for the other glove. Not to mention it makes you less likely to accidentally drop one of the gloves and lose it. That can be frustrating. And of course they are waterproof as advertised. I tested them in some very wet conditions and they performed very well keeping my hands completely dry. The only complaint I had was that they started to absorb some water and get a little heavy and soggy after some time but even then my hands stayed dry. They are a pretty warm pair of gloves. I wouldn’t say they are the warmest pair of gloves on this website but there’s no pair of gloves that can even come close to being as warm as battery heated gloves. So for a non-heated pair of gloves they definitely impressed me especially for the price. They have the patented Thinsulate insulation which is not only very warm but it’s also quite small which keeps the glove comfortable and warm while maintaining dexterity. All-in-All these Andorra Thinsulate gloves passed with flying colors. I think that they did a really good job of giving us all the features we could possibly want while keeping the price low. So often I find that gloves that sell for under $50 are a real disappointment especially in the quality department but these ones weren’t at all. In fact I was really surprised how good the quality of these gloves were. They were almost as good as some of my higher rated gloves that cost upwards of $100. If you want a good pair of gloves for under $50 but you still want all the features of a high end glove, this is the best option for sure. The review on these gloves was great. I’ve been considering buying a pair of gloves for a while and I am now interested in this pair. Everything here was very informative, especially the fit of the glove, how it’s snug, and the warmth of the glove. I especially like that all of the fingers can use a touchscreen, very important in this day and age. And thank you for being honest about the fact that they are not as water proof as most would like, but I think this is something I could live with. I’m glad you found my review helpful. If you have any questions about these Andorra gloves or any other gloves just let me know and I’ll be happy to look into it for you. And don’t forget about heated gloves too. There are some very good ones nowadays. I was looking for a pair of great gloves for my husband for Christmas, but never really found them. What I like about these is that they’re not bulky and he can even operate his phone while they’re still on! Ya these gloves are very popular for a reason. They have everything you need but the price is surprisingly low. You really can’t go wrong with these Andorra gloves especially as a gift. This winter has been especially cold so I know a lot of people have gotten some great use out of these. Hi, I love your review on the gloves. I didnt think there would be a pair of gloves that thick to use on touch screens (Amazing) its about time we had gloves like this, ok we have the thin ones but they dont keep your hands warm,also not a bad price. The grip looks good and also the zipper pocket, how handy is that(Pardon the Pun) maybe someone should invent gloves to hold your phone aswell , or maybe there is such a glove.? Thanks for sharing these gloves. I am going straight on amazon now to have a look and maybe order some for my husbands birthday. Thanks again. Thanks for the comment. I like your idea of a pair of gloves that has a pocket to hold your phone. I think that could be really handy and the answer is No I’ve never seen such a thing. I’m glad you like the review and that you’re interested in the glove. If you’re still unsure of what gloves to buy your husband feel free to ask me questions. I’m here to help.